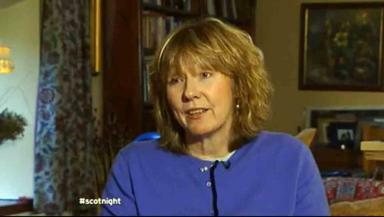 Times journalist talks to Scotland Tonight about her accident and her award-winning writing. Journalist Melanie Reid's life changed forever when she broke her neck and back in a riding accident in 2010, leaving her paralysed from the chest down. The award-winning writer shares her experience in her 'Spinal Column' in The Times each week. She talks frankly about her life in a wheelchair and the slow recovery from her accident. Scotland Tonight's Rona Dougall talked to Melanie at her home in Stirlingshire and followed her as she got back in the saddle to ride again. Her column generates hundreds of letters, emails and comments every week. Ms Reid said: "A lot of people take inspiration from it. I have black sense of humour, I think you have to have in this situation. You have to try to keep going and tell it like it is."